At TechSmith, our goal is to help content creators take advantage of the power of video in their daily jobs. But, making the video is just half of the equation. Choosing where you host your video content is one of the most important decisions you’ll make in the planning process. Today, we pit YouTube vs. Vimeo! What is the difference between YouTube and Vimeo? Two of the most popular hosting platforms today are YouTube and Vimeo. They’re both great options for hosting. We offer YouTube outputs from Snagit and Camtasia, and Vimeo from Camtasia (Windows only). TechSmith Screencast is also a great hosting option, and has outputs from Snagit and Camtasia as well. These outputs make it simple to host your videos in the location of your preference. There are some big differences when it comes to YouTube vs Vimeo and understanding those differences will help you select the right option for you. The first question I always ask myself before I ever push record on my camera: who is my audience? You should ask yourself the same question because YouTube and Vimeo have different communities of users. YouTube’s community is large, with over 1 billion users that watch hundreds of millions of hours of content – each day! With that many people comes risks. You may run into some questionable, highly offensive users that are not afraid to tell you exactly how they feel about your video. YouTube’s larger audience produces more content, but keep in mind that quantity doesn’t always equal quality. Vimeo has a much smaller community. Of its 170 million viewers, about 42 million are in the United States. Vimeo’s community is generally very supportive, and has many users that offer more constructive feedback than you may find on YouTube. Another notable distinction between the two is that with a smaller community, you will often find higher production values. Vimeo offers four membership options: Plus, PRO, and Business, Premium. They each have different levels of storage and support as you can see in the chart below. Vimeo does offer a basic, free membership, but it limits you to 500MB maximum storage per week. Alternately, YouTube is completely free with unlimited storage when it comes to hosting. YouTube focuses on making money with their advertising, not monthly or yearly payment plans like Vimeo. That said, YouTube offers a $9.99/month subscription service called YouTube Red, which allows you to view videos without ads. In addition to being able to watch videos ad-free, you will also have access to a slate of original programming, the ability to download videos so you can watch offline later, as well as a music app. Have you ever uploaded a video, then realized you needed to make a change to it? 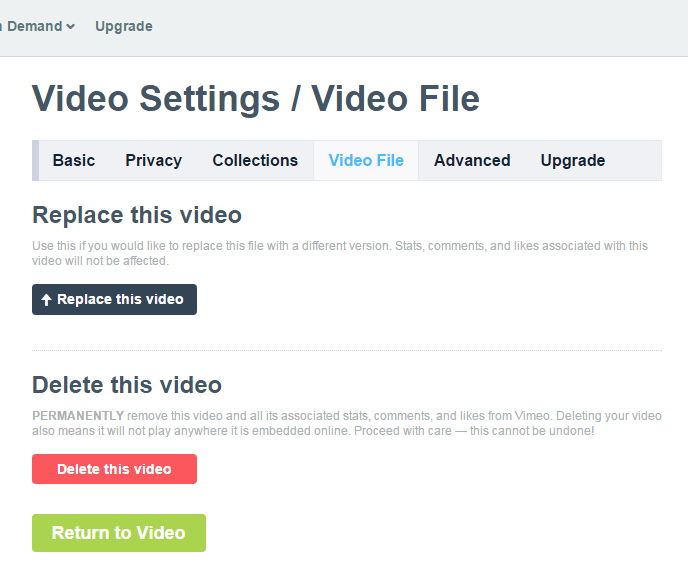 Vimeo allows you to replace a video after it has been uploaded without losing that video’s stats. This can be very helpful if you realize you made a mistake in your video, or something like a name needs to be updated. On the flip-side, when you upload your video to YouTube, it cannot be changed without completely deleting the file and re-uploading. This means that you will lose all of your views and stats in the process. If you use YouTube, double and triple check spelling and content, because once you post it, you can’t fix it! I have been hoping for a long time that YouTube will activate this feature, but so far, it hasn’t happened. YouTube will detect copyrighted music and images almost immediately upon upload, automatically disabling these elements if you don’t have permission to use them. This can help make sure you’re not infringing on a copyright unintentionally. Vimeo on the other hand, isn’t as strict and won’t disable your content. If you choose Vimeo, be aware that it technically is stealing if you don’t own the rights to any media in your video. It is imperative to use good judgement when sharing your work. You may notice that YouTube has ads all over the place both on the website and within the video player. As a marketer, you have tons of options to reach your specific audiences with highly targeted ads on YouTube, but as a viewer it can be overwhelming. Vimeo takes pride in keeping their site free from ads and you won’t see one playing before, during, or after your content. This is because, as I said before, they make their money on memberships. On the plus side, both sites offer a wide array of analytics for your video that can be extremely helpful when determining who is watching your video and how they are viewing it. Both platforms offer stats on views, comments, likes, shares, total plays, and geographical data, but YouTube offers a little more. YouTube also offers insight into traffic sources, gender, what devices your viewers are using, and audience retention. Another feature of YouTube is the ability to add annotations or “clickable hotspots” on top of your video that allows viewers to interact. Vimeo offers password protected content. This can be great if you are reviewing content with clients and want to keep it hidden. 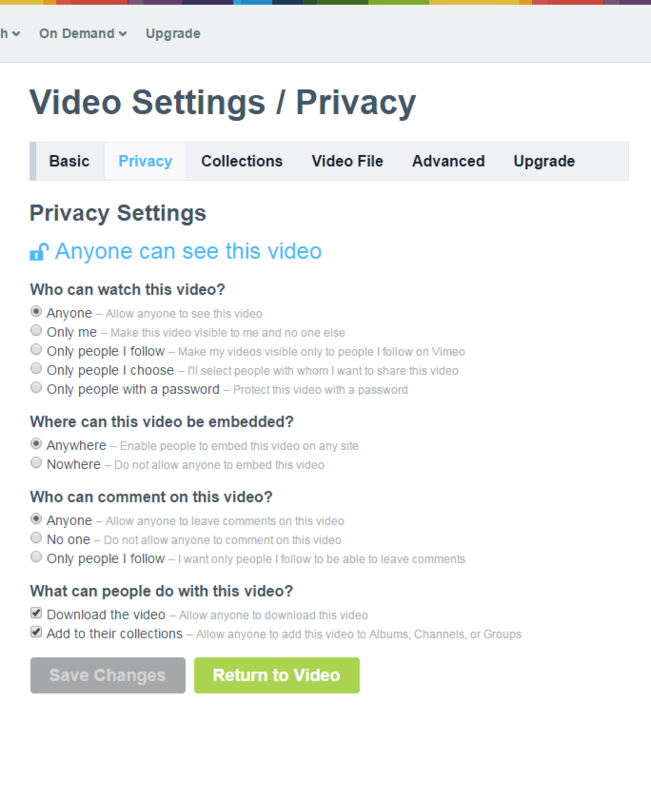 Vimeo offers a variety of other privacy options as well. YouTube allows three options; public, unlisted and private. Unlisted means only those with the link can view it, while private means only those you invite with an active YouTube account can view it. In the end, it really depends on the audience you are trying to reach because both platforms offer great resources for businesses who are expanding into the world of digital video. There are also a lot of other online video platforms to choose from now, and finding the right one depends on the features and functionality you need for your videos. Here is a reference chart comparing the features and functionality of Vimeo, YouTube and Screencast to summarize, and you can read a more in-depth comparison of these platforms here as well. Where do you host your videos? Which features are most important to you? Let us know in the comments! Note: This is an update of a post originally published November 2015. It has been updated to reflect changes to the hosting platforms. *Sharing to YouTube from Snagit is only supported for video, not image files. Vimeo is TM + © 2018 Vimeo, Inc. All rights reserved. You can edit videos on YouTube after publishing by using the YouTube editor. That way you will not lose your stats or url. Interesting, thanks Mike! I know a lot of professionals prefer vimeo, but without a fast internet connection the higher bitrate of vimeo just results in stuttering and waiting for video to load. I don’t want to put my viewers through that experience. You can do an interesting experiment by playing these two videos to see loading times and quality comparison here: http://blog.waterworld.com.hk/post/hd-quality-youtube-vs-vimeo to see how it works for you. Thanks for the comment! That’s a good point. Load times can vary depending on your location and internet connection speeds. Overall, I would give YouTube a leg up because of their resources and size of their infrastructure. Over time though, I imagine that Vimeo will be able to come closer to those load speeds as their network continues to grows. Hi James, yup the YouTube editor can work when you’re in a pinch. Like when you need to trim out a clip or cut out the black at the beginning/end of a video. But if you wanted to make any types of larger changes, you may be forced to re-upload. YouTube offers about the best captioning tools around (with the possible exception of Camtasia Studio 🙂 Vimeo, not so much. You can caption manually with Amara, but that’s a far cry from the combination of world-class voice recognition and a great caption editor as fond on YouTube. Those of us who MUST caption (mainly in CA) love YouTube for this! Do you get better SEO results via google if you host company videos on Youtube over Vimeo? I have a Vimeo Plus account but cannot upload training videos or ‘how to’ tutorials that I create in Camtasia. Vimeo considers these commercial content and therefore a Vimeo Pro account is required. It is something to consider when comparing YouTube and Vimeo. why is the quality of my Vimeo film, when I place it on my website a bad copy? The YouTube version seems to be of a better quality then Vimeo. Vimeo is more blurt, vague. Who has the same experience? I had the same problem and Techsmith gave me a solution. You can ask them, or send me a mail (tineke@noordknoop.nl), then I pass it over to you. Does anyone has the same problem? The Vimeo version of my video is okay, but as soon as I place it on my website it is vague, not sharp anymore. This doesn’t happen with YouTube. Who knows why? Hi Tineke, thanks for the comment! Sorry for taking so long to respond. I think the reason you are experiencing this is because the account you have on Vimeo is the free version, which does not allow HD embedding of your videos on external sites. In order to be able to embed videos on your website that are HD, you need to upgrade to the next payment tier unfortunately. Hi Michael, thanks for the comment! I think SEO depends heavily on the titles and tagging you decide for your video, as well as the content of the video. Google ranks videos higher that have information relative to what people are searching for. I think Youtube may be a little better since Google owns it, but I have seen many Vimeo videos that rank high on search as well. Really depends on the title, description, tagging, sharing and comments that your video has. It also helps if popular websites refer to your video as well, or if it is posted in many trust-worthy places. Hi Haruki, there is an option under the video settings that allows you to check a box if you want viewers to be able to download it. I agree Dave! I have not used Vimeo’s captioning a ton, but I have noticed that Youtube is a little further ahead in this area. Valuable points to be noted. Thanks for the article. I prefer and I use Vimeo mainly because of no ads. You are right about that fact. Thanks for pointing out that. شركة الاوائل من اهم الشركات التى تعمل فى مجال التنظيف وتتمتع بتاريخ عريق فى مجال التنظيف وبالاخص فى تنظيف الكنب فاذا اردت ان تشعر بالفرق الواضح بينا وبين اى شركة اخرى تقوم بنفس الخدمة فعليك ان تستعن وتتصل ب شركات تنظيف كنب بالرياض على الفور وتاكد انك سوف تشعر بالفرق الواضح بينا وبين اى شركة تقوم بنفس الخدمة على الاطلاق. لا تترد في الحصول علي شركات مكافحة الحشرات بالرياض من شركة الأوائل للتخلص للأبد من إزعاج الصراصير و النمل الأبيض و البق و غيرها و الحفاظ علي منزلك نظيف و جميل. Question – Can I host a video on either YouTube or Vimeo and change the privacy so that I can put the video on a membership page that is behind a login? I need a place to host videos that are for member’s only. YouTube has a private setting, but can I grab the “share” code and put the video on my WordPress site? Vimeo’s down-conversion of video is not very clean. As a result if you upload an HD or Retina video but don’t adjust the resolution and frame rate to the supported values the video is done by Vimeo on the fly, often with the most basic resolution. Yes. We make the video “Unlisted” and then embed the url in our WordPress page. If you make it “Private”, the user would have to have their own YouTube account, but with “Unlisted”, no one sees it unless they have the specific url. great work! keep writing.It was of great help! also click here for more info on the same topic and related.